Having said earlier many idyllic things about the vigil’s sense of sisterhood, solidarity, and consensus-driven decision-making, in this chapter I’ll talk about conflict and dissension, about the forces that existed and the power plays to advance them, about how we managed to get along inside all this, and about how, one rainy morning in Jerusalem, the good feeling melted, ending the trust that we had so painstakingly built up over the years. But, first, the good news. 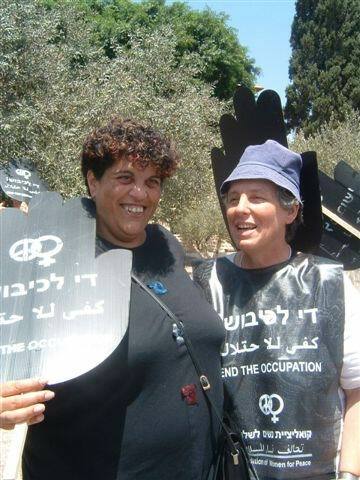 How did Hagar Roublev ever get along in the same vigil as Anat Hoffman? Hagar, aged 34 when the vigil first began, was probably the closest that Jerusalem Women in Black had to an unofficial leader, even though her views were in the minority and almost never carried the day in our decision-making. Nevertheless, if every woman on the Jerusalem vigil were asked for her list of key Women in Black, several women would appear on many lists, but not a single list would be bereft of Hagar’s name. Although Hagar was only one of the 15 founding mothers of the vigil, she wore a mantel of specialness for us all. Hagar describes herself as “rough, tough and fearless, probably because I’m so big” (5’9”). But Hagar is more than just tall and tough: she’s smart, she has the fastest tongue on two tonsils, and her entire life is driven by her ideological principles. Having quit school in 11th grade, Hagar got her education reading communist literature under the tutelage of her radical left father and then did her internship on the streets. She refused to serve in the Israeli army and won an exemption by a well-timed marriage (one of three). An avowed Maoist, Hagar then left Israel and spent a dozen years organizing workers abroad: 2 years in Columbia, South America; 4 years in the United States; 3 years in France, and 2 years combined in Austria and Portugal. As a result of her ideological globetrotting and considerable talent, she speaks 6 languages fluently (Hebrew, English, Spanish, French, German, and Portuguese). If I make Hagar sound like the fierce, fearless, idealistic, take-no-guff Amazon that she is, you have only to see her shepherding her children around town from the home for the retarded that she now heads to realize that Hagar is one very complex and wonderful woman. In every gathering of the movement, I’m in the minority. Every proposal I make goes under. What do I do? Grit my teeth, accept majority rule, and raise the same proposal over and over again in the following meetings, until I give up. Hagar has also been heard to say that she “felt like a Moroccan among arrogant Ashkenazis” in the movement she helped found. There’s no denying that most of the vigils were composed of Jews of European (Ashkenazi) origin, the privileged class in Israeli society, as opposed to Jews of Mizrahi origin – from Muslim countries. This has always been a sore point for Women in Black, who otherwise considered ourselves politically correct. But Hagar was certainly right about that. One of those privileged Ashkenazi women was Anat Hoffman, aged 33 when the vigil began. Anat grew up in Jerusalem with American roots and was given a bourgeois liberal education buffed by degrees from UCLA and Bar-Ilan, both in psychology. Anat has always been a goal-oriented superachiever. As a teenager, she demolished the Israeli record books in sprint swimming and won Israeli championships in freestyle, backstroke, and medley. Unlike Hagar the atheist, Anat is a devout Reform Jew, one of the founders of a liberal religious school where the parents are almost as involved in their children’s education as the children themselves. Anat grew up believing in Zionism and the vision of a Jewish state as a “light unto the nations”. She fights the good fight from within the Citizen Rights Party, where she has made a name for herself as a crusader for consumer rights and the Robynne Hood of those victimized by the ultra-Orthodox establishment. Anat’s battles against religious coercion also include her activism in the Women of the Wall prayer group, fighting for the right of women to pray out loud beside the Western Wall, a bastion of ultra-Orthodoxy that frowns upon women’s assumption of male rituals. Anat has always fought for full rights for Arab citizens of Israel, but all this within the state of Israel. And a Palestinian state next door, of course. But on the vigil, Hagar and Anat developed more than a grudging respect for each other, though Hagar would probably deny this vehemently, just to protect her reputation. While there were political differences among us, women on the Women in Black vigils were demographically more similar than different: 84% had some form of higher education (most in the humanities), and many had advanced graduate degrees; 85% were engaged in income-producing work, compared with only 48% of Israeli women in general; and Women in Black were also predominantly of Ashkenazi origin, as noted. It would be incorrect, however, to equate the foregoing with higher income: On the contrary, many Women in Black held low-paying jobs (social workers, librarians, teachers, jobs with non-profits, etc.) or lived on a kibbutz with low income levels. This was most likely a group of rather low-income women, although statistics were not collected about this. That most Women in Black worked was also not surprising, considering that 55% lived without a partner and fully 25% did not have children – both very high proportions in a country addicted to marriage and children. Hence, this was by and large a group of independent-minded and self-sufficient women and also, not surprisingly, free-thinking: 87% categorized themselves as “not religious” in a country where fewer than half the population would define themselves that way. As for age, the average age was 47, but this does not reflect the very wide range: The youngest self-propelled Woman in Black (leaving out the tots who were brought by their mothers) were junior high school girls and the oldest were pushing 90. Indeed, there were quite a few women in their 80s. There were also, as noted, a small but courageous number of Arab Women in Black, but no numbers seem to have been collected about this. An indicator that sociologists often leave off their list: There were a great many lesbians in the group. One number that has been frequently used is 30%. This is a very high figure, but corroborated by head counts done sporadically at city vigils and further evidence: I went through the lists of the organizers of 8 different national conferences organized by Women in Black (actually by Women and Peace, which was the national coordinator of Women in Black conferences), and also came up with 30%: 16 out-lesbians out of 53 organizers. And, most likely, the number of lesbians among those not involved in organizing was somewhat lower. I say this based on the fact that the cities in general have more out-lesbians than the villages and kibbutzim, and most of the organizers were city women. Any way you look at it, lesbians were clearly a large and active portion of Women in Black. This is a major segment of women’s peace activists, and one that has gone unacknowledged for too long. Hannah Safran from the Haifa vigil has written a fascinating analysis of the lesbian presence in Women in Black, pointing out their high number and virtual invisibility. Hannah attributes this to the “ideology of inclusion” of the movement – not acknowledging differences for fear of alienating some women. While the principle of inclusion maximized the number of participants – anyone who shared the minimalist platform of opposition to the occupation was welcome – the price of invisibility was a high one: “Although inclusion was perceived as acceptance of diversity, differences were not recognized and identities not allowed. As a result, lesbian identity was erased and a hegemonic heterosexual identity prevailed within the vigils and in the public eye.” Hanna feels that the vigil was a lost opportunity for deepening understanding of the different forms of oppression of women, and for recognizing the connections between the oppression of Palestinians, of women, and of lesbians. While the women on the vigils were demographically alike, we were politically diverse. Although we represent the “political left” in Israel – those who want to make peace and reach an accommodation with the Palestinians and other Arab neighbors – we hold a variety of views about how to go about it. Some of us (like Hagar) consider ourselves “non-Zionist”, believing that Zionism has been used to justify occupation and other racist actions. Many of these women wish to see not a separate Palestinian state, but one large, secular binational state – for Jews and Palestinians together. Some of us (like Anat) consider ourselves “Zionist”, believing that Zionism is the national liberation movement of the Jewish people, and that actions like occupation and racism are perversions of the authentic meaning of Zionism. These women want to see a Palestinian state established next door to the Israeli state. And there are all sorts of variations on these themes. Hagar and Anat represent two points on the range of views of the vigil, but they were not the most extreme end. This was an honor reserved for the women of Nitzotz (full name: Derech Hanitzotz) on the left, and some Labor-voters (supporters of hawkish Rabin) on the “right”. More about the extreme left later. But Hagar and Anat can generally be said to represent the two main camps: the non-Zionists and the Zionists, respectively. Our motivations for standing on the vigil also ran the gamut. Some women joined out of solidarity with the Palestinian political cause. Some joined primarily to protest the inhumanity of Israelis to Palestinians during the occupation. Some women stood on the vigil because they didn’t want to see their loved ones (sons/husbands/fathers) who served in the army endangered by the intifada. As our vigil grew in size, I was ecstatic. But there were women who were upset that the vigil was growing and that they no longer starred in or controlled it. These were “professional leftists” who were used to being at the center of tiny, mixed left wing groups. All sorts of women were joining the vigil, and these professional activists began telling them they weren’t “political” enough. I waged a pitched battle against these left wingers for a very long time. Most of them ended up leaving, and those that remained learned to accept the fact that here in the vigil we’re all equal, that the vigil belongs to us all, and that we came to demonstrate and not to formulate manifestos. The vigil belongs to the women who participate in it. Period. This not only makes for a larger vigil, but it gives women who had never before participated in politics a sense of self-respect. We, Women in Black, citizens of Israel, have held our weekly protest vigil since the beginning of the intifada. This vigil has grown out of Israeli society and expresses our need to actively and strongly oppose the occupation. The black clothing symbolizes the tragedy of both peoples, the Israeli and Palestinian. We protest the occupation and call upon the government to put an end to killing and bloodshed, to the destruction of homes, to expulsions, to administrative arrests, to collective punishment and to extended curfews. We have had enough of brutality, violence, callousness, the erosion of morality in our society, and the heavy economic price paid by us all. We are women of different political convictions, but the call “End the Occupation” unites us. Many of us are of the opinion that the PLO (Palestine Liberation Organization) is the partner for peace negotiations based on the principle of two states for two peoples. Others among us believe that it is not for us to decide who should be the Palestinian partner for negotiations or what the solution is to achieve peace. We are unified in our belief that our message is just and powerful and will bring about the peace. The protest vigil of Women in Black takes place every week at the same time throughout Israel. We call on all women to join our persistent, staunch and non-violent protest. How mild-mannered can you get. This was a tradeoff: The blandness of the message enabled Jerusalem to have a larger vigil. By then, even Peace Now had openly espoused more “radical” views, including “two states for two peoples” and “negotiate with the PLO”. We had carefully written that only some of us favor these views. But notwithstanding our guarded words, we were still perceived as more extreme than Peace Now, even by those sympathetic to our views. Why? Women in Black were regarded by people outside the vigil – left and right – as far more rooted in the extreme left than we actually were. Perhaps this was because the extremist Nitzotz women participated in the vigil. Perhaps because most vigils flew no Israeli flag. Perhaps because of our participation in the radical Women and Peace Coalition (see chapter eleven). And perhaps simply because, in Israel, it was such a radical act for a group of women to stand up in public, wear black, and express a political point of view. I think all the foregoing were factors in lumping us into the category of radicals. Even people on the left assumed that we were far gone extremists. Yossi Ben Artzi, a Peace Now founder and leader, warned Peace Now not to adopt radical views “out of fear of losing dominance in the protest movement to organizations such as Dai LaKibush, Year 21, or women in all sorts of colors” – the latter, of course, a snide reference to Women in Black. Even Yael Azmon, an avowed leftist and feminist who has researched women’s protest in Israel, uses the r-word on us: “Women in Black are at the radical pole of the women’s movements, both politically (its slogan being “End the Occupation” rather than “Start Peace Negotiations”), as well as from the feminist aspect (Women Only, rather than in their function of mothers).” Thus, because our slogan was phrased in negative rather than positive terms, and because we spoke as women rather than mothers, we were “the radical pole”. In fact, because the image of Women in Black was so much fiercer than our official position, we even considered a number of measures to correct this impression: taking out an ad in the newspaper to state our official view clearly or publishing a book to reflect the diverse voices among us. But ultimately we gave up these ideas, both for lack of funding and because we thought that knowing the facts might not, in the final analysis, make a difference. Stereotypes are stereotypes, and the truth often does not budge them. Thus, the vigil contained many politically diverse views. But because in numbers there is strength, we pursued consensus and evolved the structures and formats that accommodated diversity; and we found that the Women in Black movement was able to accommodate a greater range of political views within it than the small mixed-gender peace groups. Thus, the wolf and the lamb were able to dwell together. About most matters. Now we get to the hard stuff, though not yet the bad news. There were a number of issues that brought out the conflicts within the movement. The first of these appeared to be resolved easily, the question of how to respond to violence toward the women. Despite the willingness (downright pleasure) of some of us to engage the forces of darkness, the group voted resoundingly for nonviolent resistance. Many women said they would not return to the vigil if we responded in kind to our attackers. That was enough to end the discussion, on the principle of avoiding the alienation of any large group of women. This decision was unmitigated defeatism, just like our shameful capitulation in not doing battle with the Kahanists who broke into the synagogue and disrupted our meeting. The women excuse their defeatism by saying, “We refuse to do battle with the Kahanists. We’re on the vigil to oppose the occupation, not the Kahanists.” I don’t agree. In my opinion, the left must fight the Kahanists and their ilk. Definitely, the left must do battle with the right. But I’m in the minority here, and that’s the price we pay for having a pluralist vigil. Although it goes against every grain in my body. Displaying the Israeli flag was another source of conflict. In some vigils, the women proudly displayed the Israeli flag as part of their message. Most kibbutz vigils displayed the flag, but not those held at Megiddo or Gan Shmuel or several others. However, in Jerusalem, Haifa, and Tel-Aviv, display of the flag was a no-no, although some women (like Anat) wanted it up. In early 1990, about two years into the vigil, Women in Black in Jerusalem held a series of discussion over whether or not to display the flag. One group said that the flag belonged to us all and we shouldn’t allow the right wing to appropriate national symbols. Others said they would not stand under a flag that oppresses almost two million people. Some said they would add the Israeli flag only if the Palestinian flag were raised there as well (an illegal act in those days in Israel). The debate raged over several meetings, pitting the Zionists against the non- or anti-Zionists, until finally the principle of the lowest common denominator prevailed. This did not pacify the committed Zionists among us. I remember Nechama Ben-Eliahu saying, “What if the Zionists said that they refuse to attend a vigil that does not display the flag?” But the Zionists did not play the game of brinkmanship as well as the more seasoned radicals. And then the status-quo principle was invoked – any situation that previously existed has greater a priori justification than change. (This principle is actually used extensively in Israel with regard to religious matters.) Thus the forces for flying the blue-and-white lost out. The memory of that defeat was frequently and bitterly invoked by the Zionists. But the subject over which we in Jerusalem argued the most was whether or not to add new slogans to our one modest motto “End the Occupation”. We haggled over this in meeting after meeting. The more left wingers demanded “two states for two peoples” or “negotiate with the PLO”, but some hesitated to alienate listeners from our main message. Most of the vigils outside Jerusalem had long ago espoused these and other slogans. Finally, after unofficial surveys and straw polls, debates and a tense vote, two additional slogans – together – were adopted for the Jerusalem vigil: “Two states for two peoples” and “End the violence” – satisfying both the left and the right among us. It was hard, but we were proud of the way we had gone about the decision. We had stuck to the rules of the game. It had taken us three years on the vigil to agree on additional slogans, but agreement came too late. The final vote to add new slogans took place in December 1990, three weeks before the Gulf War erupted, and suddenly we had more important things on our mind. The new slogans got lost in pre-war anxiety. And then something happened that struck at the very core of the solidarity of the vigil. Now comes the bad news. To tell this story, I finally have to tell you about Nitzotz, to whom I have referred all along as the “extreme left”. Without delving at length into their history, Derech Nitzotz [the way of the spark] is a small group of Israelis who (then) believed fervently in what is called in Middle East shorthand a “binational state”. This means that neither the Palestinians nor Israelis will have a state of their own, but will live together amicably in one sovereign state with democratic rights to all. While this may sound like paradise on paper, it feels very threatening to Jews who believe they need a state of their own as a refuge for persecuted Jews throughout the world, and that they would become swallowed up by a binational state in which Jews would certainly be a minority. In short, the Nitzotz point of view is democratic, utopian, and anathema to the Zionist vision. Members of the tiny group of Nitzotz activists are not just smart and idealistic, they are also totally devoted to their cause. They work full-time at writing, organizing, and recruiting to advance their efforts. During the pre- and early intifada period, they were allegedly funded by one of the Palestinian parties headed by Naif Hawatmeh, a terrorist whose most vicious attack was against an Israeli elementary school (Ma’alot) in May 1974 in which 27 Israelis, mostly children, were killed. Hawatmeh’s goal was to overthrow Israel, violently if necessary, and replace it by a secular democratic state in which Jews would be a tolerated minority. You can imagine how popular a group of Jewish Israelis would be that has ties to Naif Hawatmeh’s party. Thus, it was not surprising when five members of Nitzotz were arrested (one was later released) and, after some legal shuffling, plea bargained to a charge of membership in an illegal terrorist organization, and served between nine and thirty months in prison. The women of the group missed 9-18 months on the vigil. While I do not agree with the ideology of Nitzotz – few Women in Black did – they are exceptionally impressive as individuals – intelligent, articulate, and zealously dedicated. When Women in Black held meetings to work through its issues, we always listened raptly to the well-reasoned arguments spun out by Michal Schwartz or Roni Ben Efrat of the Nitzotz group. Now for the sad story. One early Friday morning, January 18, 1991, Saddam Hussein dropped the first of 40 Scud missiles on civilian targets in Israel. The Israeli Civil Defense announced that everyone should remain indoors until further notice, and only Tel-Aviv held its vigil that afternoon. The following week, missiles were still landing sporadically in Israel and civilians were told not to congregate on the streets. Again Tel-Aviv held the only vigil. By the third week, however, Jerusalem Women in Black were restless. We had never before abandoned the vigil even once during the first three years, and this felt wrong to us. Many of us also felt the need to talk to each other. We were, after all, a peace movement and a war was going on. Besides which, we were an important support group for each other in clarifying our position on political matters. Women in Black were just good folk for thinking through the issues. And some women really wanted to return to the vigil. Right away. So two weeks and a day after the war began, about 40 of us from Jerusalem crowded into the home of Yvonne Deutsch and talked about the vigil. Many women felt that the war was entirely wrong and the vigil should reflect that. Yvonne proposed that we demonstrate against the war, but only a few women seriously took up her suggestion. Many Women in Black supported American involvement, feeling, like most Israelis, that President Bush was fighting the war on behalf of Israel. Then talk began about returning to the vigil. This was the first of two stormy sessions, causing great internal stress and bringing up strong feelings. Those who opposed American interference in the Middle East were the strongest supporters of returning to the vigil at once. They pointed to the fact that the occupation was particularly cruel during the war (curfews and the use of force) and we must use the vigil to protest these human rights abuses. This was generally an anti-imperialist-America crowd. Other women believed that Israel was under attack and now was the time for all its citizens to close ranks. They felt that standing on the vigil would give a message of alienation from our countrywomen and men. Since most Palestinians had been supportive of Saddam – indeed, some had watched from their roofs and applauded as the missiles soared overhead toward Tel-Aviv – this group felt that a vigil to end the occupation would be interpreted as “pro‑Saddam”. We would be destroying whatever public support and sympathy we had won until then. Anat: There would be something detached and ludicrous about a group of women holding up cardboard signs [against the occupation] when the entire country is walking around with gas masks. I voted against holding the vigil out of a sense of community with the women among us who needed more time before returning to the vigil. Hagar: I voted to return to the vigil because, in spite of all that jive about being a community, no one is gonna tell me whether to demonstrate or not. We can vote about the kinds of slogans, but no one can take from me the right to go out on the streets and demonstrate. The debate raged for hours, but we could not reach the consensus that we had usually found in the past. Rather than risk a simple majority rule – and alienate women in the minority – we chose to put off the decision, hoping some agreement would fall into place by then. Finally we decided to hold the decisive meeting on Friday morning, two hours before the vigil would begin. We were almost fifty women crowded into the dreary headquarters of the Israel Communist Party in downtown Jerusalem, the largest place that wouldn’t make us pay for using their space. Most of us were wearing black, figuring that we would do whatever the group voted, even those, like me, who planned to vote against returning to the vigil so soon. Her words stunned us. The room suddenly filled with shouts of anger. Michal’s group had broken the unwritten rules of the vigil: of respecting community, of not alienating others. Indeed, some of her supporters had been so disdainful of our point of view that they hadn’t even bothered to show up for the debate. Through all the shouting, the moderator called for the vote. Michal had surely swayed the results in her favor by declaring that the vigil would be held regardless of the results: 23 voted to hold the vigil, 10 voted against, and 11 abstained, some in protest at Michal’s remark. Michal had won the vote, but ultimately lost the vigil. The sense of trust had dissipated. .Neri Livne, “Seeing Black”, p. 27. .The ultra-Orthodox, who have sole authority over the Western Wall prayer area, consider a woman’s voice erva – indecent. In the wake of prayer ceremonies held there by the Women of the Wall, a new regulation to the Law of Holy Places was passed that prohibits any religious act that offends the sensibilities of others. .Statistical data are taken from research about Women in Black conducted by Tamar Rappaport and Sarit Hellman, “The Secret of Their Survival”, Women in Black National Newsletter, Spring 1993, No. 5. Data presented are from the Jerusalem vigil, but the researchers claim that there were no significant differences in the responses of women from other Israeli vigils. .For a critical analysis of this phenomenon, see Katya Gibel Azoulay, “Elitism in the Women’s Peace Camp”, Jerusalem Post, July 2, 1989. .See Jessie Montell in “Israeli Identities: The Military, the Family and Feminism”, Bridges, Fall 1991, based on a conversation with lesbian activist Marcia Freedman; and Elise Young in Keepers of the Faith. Elizabeth A. Richman in her thesis Edited Out: Israeli Women’s Peace Groups After 1967, quotes Debby Lerman and Chaya Shalom with an estimate of 50%, and Yvonne Deutsch and Hannah Safran with an estimate of 30%. .Safran, Hannah, Alliance and Denial: Feminist Lesbian Protest Within Women in Black, Master’s Project for Simmons College, Boston, n.d.
.Livne, “Seeing Black”, p. 27. .Yossi Ben Artzi, “Getting Off the Train”, Ha’aretz, February 6, 1989. .Thanks to Yael Azmon for permission to read and quote from her yet unpublished manuscript: “War, Mothers and a Girl with Braids: Involvement of Mothers’ Peace Groups in the National Discourse in Israel”, Families as Educators for Global Citizenship, J. Myers-Walls, P. Somlaip, and R. Rapoport (eds. ), London: Avebury, forthcoming 1997. .Naif Hawatmeh, leader of the DFLP (Democratic Front for the Liberation of Palestine), advocates a “people’s war” in which working class Jews and Arabs fight against “Zionist and imperialist forces”. ©1996 Gila Svirsky, Standing for Peace: A History of Women in Black in Israel available on www.gilasvirsky.com. Please cite this full reference if you quote passages from the book.